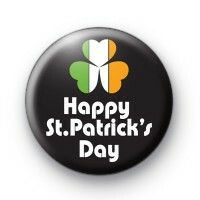 A Black St Patrick's day badge with an Irish flag coloured shamrock/clover leaf design and the text Happy St Patrick's Day in bold white font. These St Patrick's Day badges are perfect for everyone who celebrates St Patrick's Day. For all of you lovers of this Irish tradition. We have a huge selection of St Patrick's day badges, they have their own category so be sure to check them all out. Standard 25mm badge hand made in our UK workshop.